Scunthorpe United went top of the League Two table despite Danny Rose netting an injury-time equaliser for Bury. 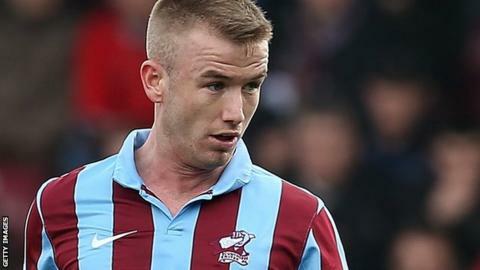 Scunthorpe broke the deadlock when Paddy Madden poked the ball home before Tom Soares nodded a leveller for Bury. The hosts were ahead again when Terry Hawkridge was felled by Danny Mayor and Paul Hayes scored his rebounded penalty. Rose then popped up in stoppage time to curl in an equaliser from distance. The result means that Scunthorpe go top of the table after Rochdale slipped to defeat at Mansfield. Bury are 11th. "I thought we were absolutely outstanding second-half. I'm disappointed obviously not to see the game out but you've got to give Bury credit. "Results have gone our way though. We have gone top of the league so no moans and groans about that. "I just want to talk about the positivity and credit to the group again. "We're at home and there's a lot of pressure on the players. We've got some young players out there and I thought they handled the situation well." "We were outstanding in every aspect of our play. The defending was top drawer. "We never give up, It's something instilled in this group, instilled in this club and they've done me proud as the manager of Bury tonight with that performance. "The lads deserved to come away from here unbeaten. We came here and dominated the pitch in a lot of good areas against a top side. To go toe-to-toe with them makes me proud." Match ends, Scunthorpe United 2, Bury 2. Second Half ends, Scunthorpe United 2, Bury 2. Goal! Scunthorpe United 2, Bury 2. Danny Rose (Bury) right footed shot from outside the box to the top right corner. Assisted by Clive Platt. Substitution, Scunthorpe United. Deon Burton replaces Hakeeb Adelakun. Corner, Bury. Conceded by Marcus Williams. Corner, Bury. Conceded by Sam Slocombe. Attempt saved. Andrew Proctor (Bury) right footed shot from outside the box is saved in the bottom left corner. Substitution, Bury. Andrew Proctor replaces Tom Soares. Attempt missed. Paddy Madden (Scunthorpe United) right footed shot from outside the box is close, but misses to the left. Goal! Scunthorpe United 2, Bury 1. Paul Hayes (Scunthorpe United) right footed shot from very close range to the centre of the goal. Penalty saved! Paul Hayes (Scunthorpe United) fails to capitalise on this great opportunity, right footed shot saved in the bottom left corner. Penalty Scunthorpe United. Terry Hawkridge draws a foul in the penalty area. Penalty conceded by Danny Mayor (Bury) after a foul in the penalty area. Attempt saved. Terry Hawkridge (Scunthorpe United) right footed shot from the centre of the box is saved in the centre of the goal. Corner, Scunthorpe United. Conceded by Chris Sedgwick. Substitution, Scunthorpe United. Paul Hayes replaces Sam Winnall. Substitution, Scunthorpe United. Michael Collins replaces Matthew Sparrow. Corner, Scunthorpe United. Conceded by Andrew Tutte. Goal! Scunthorpe United 1, Bury 1. Tom Soares (Bury) header from the centre of the box to the bottom right corner. Assisted by Chris Sedgwick with a cross. Eddie Nolan (Scunthorpe United) is shown the yellow card. Foul by Eddie Nolan (Scunthorpe United). Danny Rose (Bury) wins a free kick on the left wing. Corner, Bury. Conceded by Eddie Nolan. Substitution, Bury. Clive Platt replaces Chris Hussey. Goal! Scunthorpe United 1, Bury 0. Paddy Madden (Scunthorpe United) right footed shot from the centre of the box to the bottom left corner. Assisted by Hakeeb Adelakun. Corner, Scunthorpe United. Conceded by Chris Hussey. David Mirfin (Scunthorpe United) wins a free kick in the defensive half. Foul by Hallam Hope (Bury). David Syers (Scunthorpe United) wins a free kick in the defensive half. Foul by Andrew Tutte (Bury). Substitution, Bury. Danny Rose replaces Daniel Nardiello. Corner, Bury. Conceded by David Mirfin. Second Half begins Scunthorpe United 0, Bury 0. First Half ends, Scunthorpe United 0, Bury 0. Foul by Matthew Sparrow (Scunthorpe United). Hallam Hope (Bury) wins a free kick on the left wing. Terry Hawkridge (Scunthorpe United) wins a free kick on the left wing.